I recently picked up an old film camera and thought it would have been the perfect platform to capture the sights and people in New York City’s Chinatown. The gritty streets, cluttered shops and graffiti were effectively emphasized through the medium of black and white film. 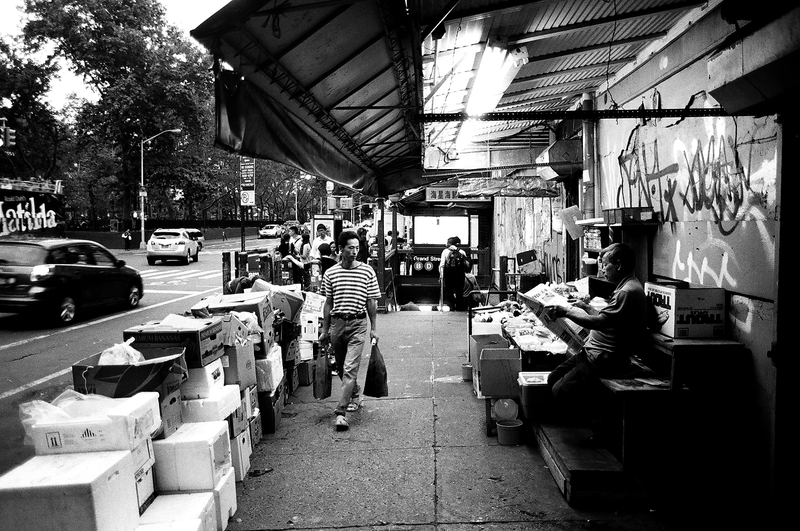 It was late in the afternoon during a muggy summer’s day as I walked through Chinatown. It was cooling down and I could feel the heat rising from the pavement. The sun was beginning to set and the lighting was just right. 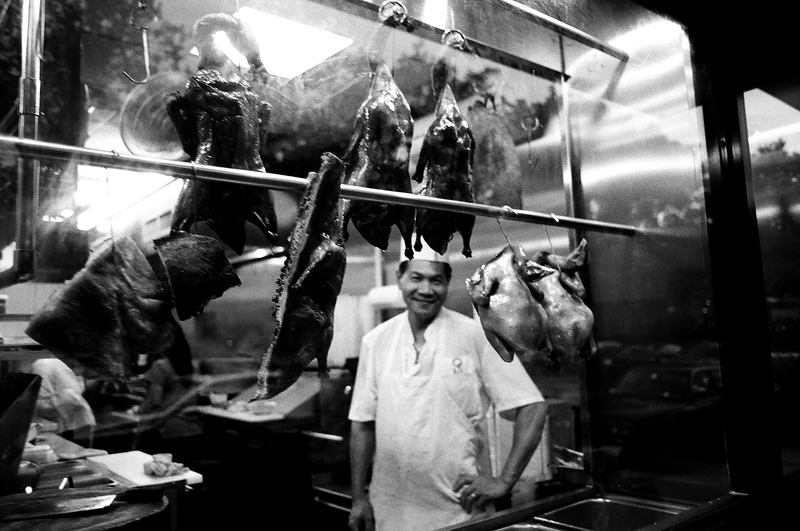 The first photo I snapped was of this jovial chef standing in his kitchen behind rows of cooked ducks. Due to some previous troubles I’ve had when photographing people, I was careful to not to intrude on his privacy. I was lucky with him though. He managed a smile for me as I was fumbling around getting the manual camera into focus. His smile ending up being framed nicely by the succulent glistening ducks. As I walked deeper into Chinatown, I became intoxicated by the overwhelming pandemonium — the chaos of sights, smells and movement overstimulated my senses. This was a busier part of the street and I couldn’t remain standing still for long as pedestrians would brush past me. A shopper looked on intently and began his purchase at the fresh food stall. By now the street merchants had noticed I was stopped in the middle of the street. I raised my camera up to my eye and captured the moment. At the time I don’t remember any specific noise from the merchants, but his mouth is clearly open and it appears to have distracted the shopper. I turned and left, marching on faster, wanting to beat the remaining daylight to finish this last roll of film. Further down the street I passed a busy merchant who was handling customers alone. 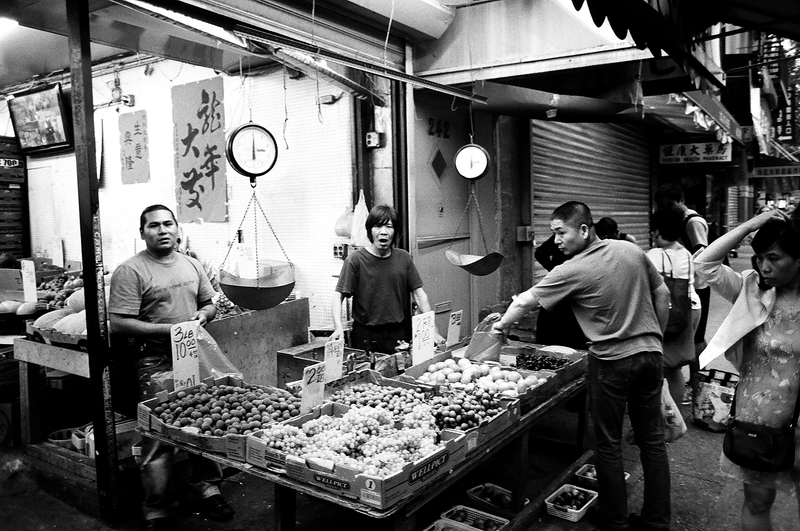 With a cigarette propped in his mouth, his hands moved swiftly from vegetables to the weigh scales. 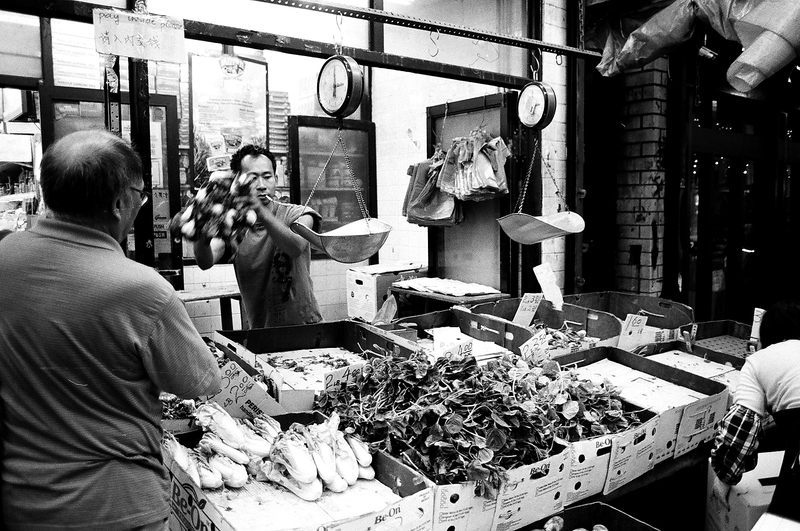 The photo portrays his speed with a slight blur on the vegetables he is about to place in the scales. I saw the customer watch on in anticipation of the cost of the final product. Everything happened swift and deftly: the weighing, the exchange of money and the return of the change. He was a master of his own efficiency. 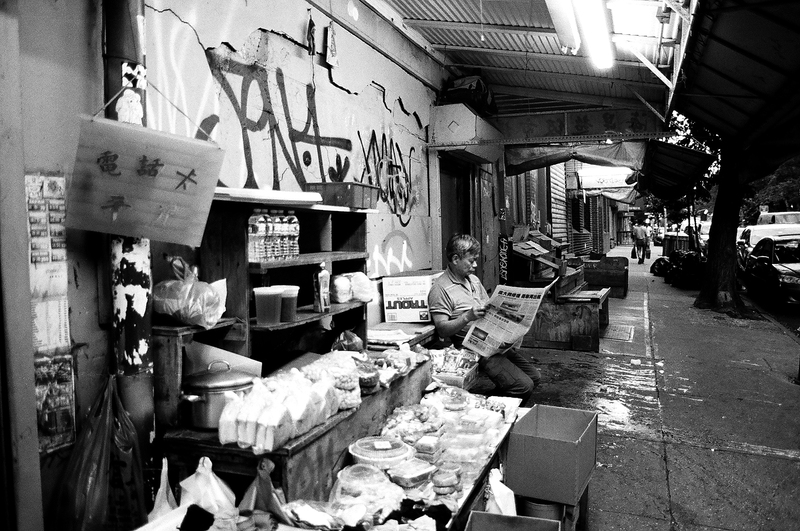 Around the corner I encountered a man who sat calmly and quietly, completely still, his gaze transfixed on the characters in his newspaper. I had managed to sneak unobtrusively into his shop area, and he did not notice that I had stopped and he continued reading on in his own world. The street was quieter around this area, but dirtier. The pavement was splattered with unrecognizable fluids and a pungent odor emanated from an unknown source. I took my time to settle on a composition I liked and focused on him. Garbage parks itself around a fire hydrant on the street in New York City. There is an idiosyncrasy to the city’s sidewalks: I have never seen so much trash in the world discarded to the side of the street, but also so quickly picked up and removed. I watched as a passerby meandered through Chinatown. Old rickety garage doors display the “No Parking Anytime” that is so commonly seen throughout the city. To me, the lettering was reminiscent of an old advertisement billboard. 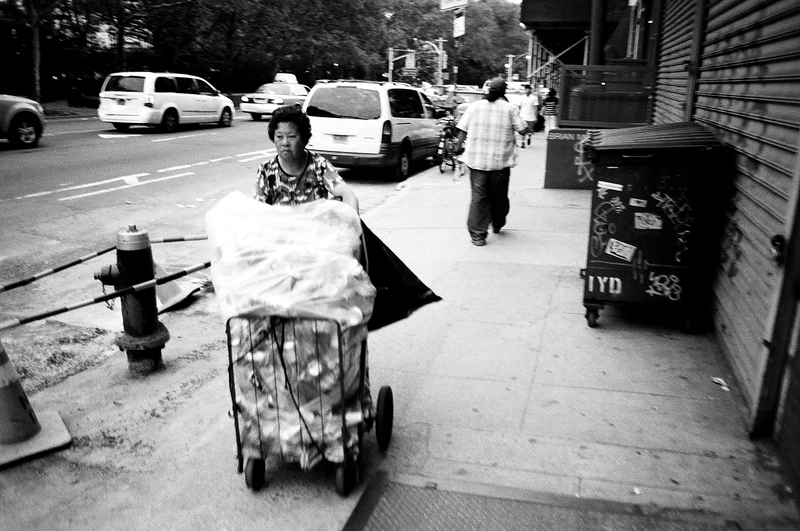 The familiar tinkering sounds of empty soda pop bottles and hollow cans reverberated throughout the street as this lady hurriedly passed me. The cans and bottles were stacked up high. I could feel her sense of urgency, and felt as if I should offer some kind of assistance. In the fleeting encounter I decided and realized all within a moment that it would seem absurd. The rattling continued all the way to the end of the street before she turned the corner. I came past the man with the newspaper again, whom the surrounding sights, sounds and smells were nothing more than feeble attempts at distractions. A passerby searched intently at the stall for something that might interest him. I noticed the graffiti on the wall, painted in black and white and completely illegible. 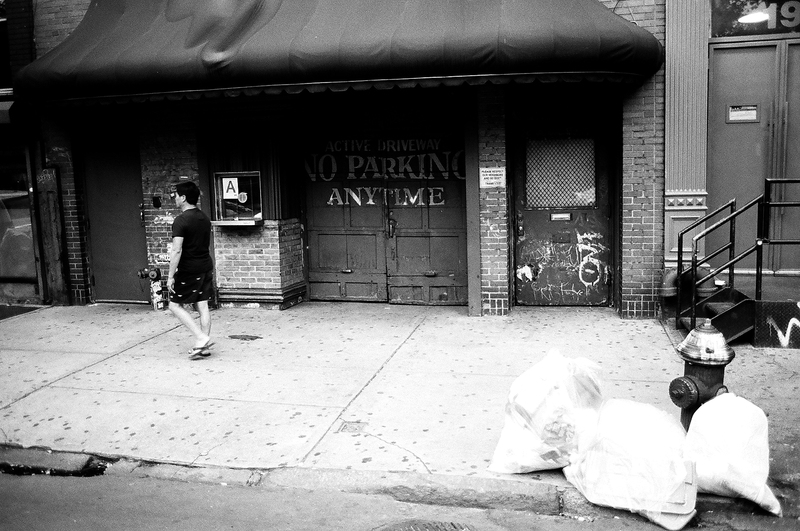 It was scrappy and emphasized the cluttered nature of the street. Across from the man, many boxes sat propped up next to the street. They performed a great job of cordoning off the road from the pavement. As nightfall approached I had almost run out of time to take anymore photographs before I snapped this one last gem. 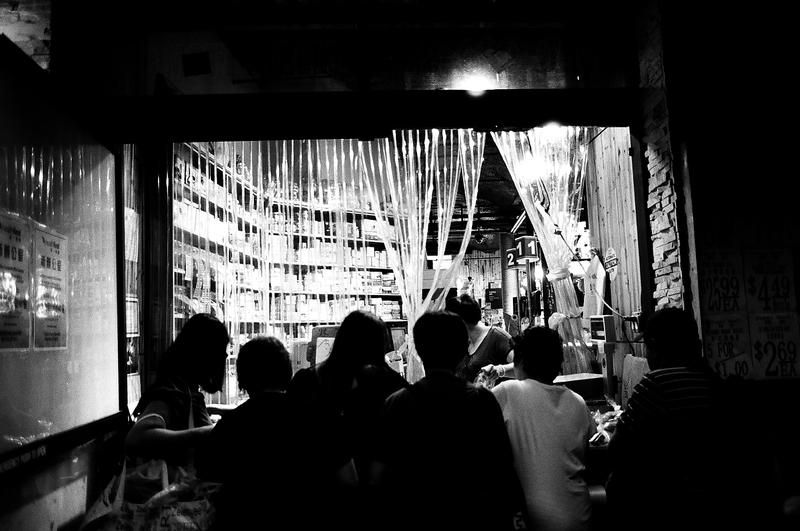 A group of people had excitedly huddled around a storefront. Their voices racing, and although they were speaking a different language, their excitement was tangible. I watched as the shop attendant dashed backwards and forwards before I focused on the crowd and took this last photo. James Grundy devours travel and culture like a shot of tequila and regularly contributes to the youth travel website Wandering Youth. With a penchant for black and white film photography, he covers many areas of youth culture including skateboarding, surfing, photography and youth travel guides. Check it out at WanderingYouth.com.